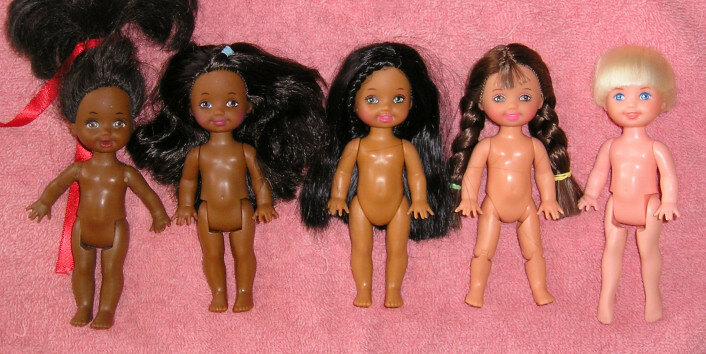 I made these pages to show the differences and/or similarities between some of the baby dolls that so often are compared to Kelly and said to be Kelly sized or even Kelly herself by people that doesn't know better. Later came Kelly that were supposed to be younger than the chubby legged bigger baby dolls, with a whole new body mold and straight legs that made her able to stand herself. 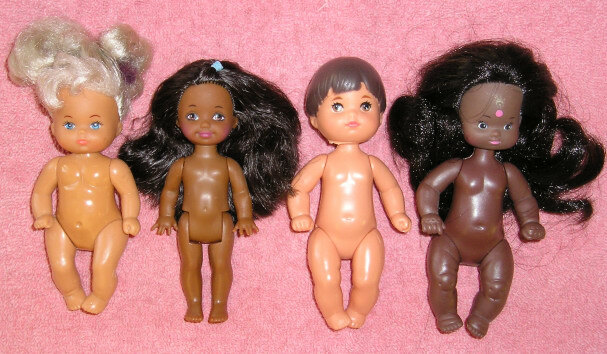 Other doll makers have had their baby dolls too, very similar to Mattel's "cuddly" baby dolls, but some smaller and some bigger. And then, when Kelly came to stay there were made copies of her too, bigger than our little darling, but with similar looks in the body. Even Kelly have had a change in her body mold, and I'm not talking levers or other gimmicks here, but her leg joint. The Pony Riding Kelly/Shelly has another joint than the regular Kelly and Li'l Friends. Those sit with their legs straight in front of them, while the Pony Riding girl sits with hers wider, like on a horseback. A lot more realistic look to it. Put them in a sandbox and you'll see who of them sits like kids really do!! There has been a few changes or additions over the years, to the body molds for Kelly doll and the biggest is yet to come in 2004....!  Click the pictures to see a bigger one. 1. Flailing arms of the Shopping Fun Kelly AA (her left hand is also pointing flat with a magnet but it is hard to see in the photo). 2. Regular straight leg body without any gimmicks (AA Picnic Kelly). 3. Sitting or spread leg body. With this joint Kelly (Keeya here) can sit without falling. 4. Bendy leg body. Marisa here can do a split or sit with her knees bent. 5. Swimming body. Tommy is the only doll made with the kicking leg feature and bent ankles. There are variations to these features and a Halloween Party doll (Spider Kelly) has both bendy legs and flailing arms - with the original spread finger hands vs the one to the far left here. New arms that swings to all sides and bigger feet on longer legs with a shorter torso, but still on a totally longer body is one of the new Kelly doll body molds from 2006-07. The "new" 2006 body to the left and "old" 1994 Kelly. Sea Pixie fairy compared to Pajama Fun (panda) Kelly. Comparison with some Kelly sized klones. Susy Sister, Mandy, Camping Fun Kelly, World Kid Japanese girl, Caitlin, Paula. 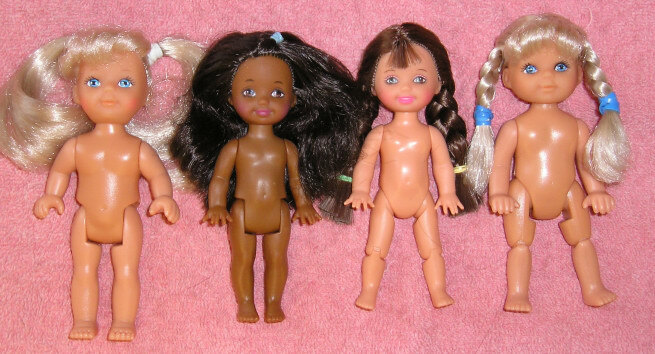 All the dolls but Paula has very similar body molds. Caitlin has another bend to her arms and Paula is totally different. Height of the dolls are the same. Kelly dolls in compare with the bigger Steffi Love Evi doll by Simba. Evi also comes with bendy legs since a couple of years back. As you can see Evi is a bit bigger than Kelly and her friends (Kelly and Marisa here). The Evi doll has also been kloned a few times. The two girl dolls to the left are Evi by Simba but the Supermodel no-name boy is made by a Danish company, Top Toys that is coworking with Toys'r Us in Scandinavia. Evi dolls are stamped Simba on their back while the klones have no stamp. Top Toys also makes the Little Sister dolls that is another clone doll. 1. Steffi Love no-name baby girl - comes in a twin set with a brunet baby boy doll. She is a bit smaller than the two dolls to the far right. 3. Teacher Barbie student boy. 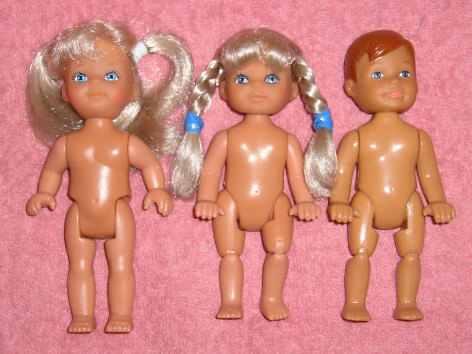 Other Mattel dolls made with this body were: Heart Family twins and friends, Rosebud dolls, the two kids in the TRU Barbie Love-to-Read giftset and the European release Barbie Li'l Friends.